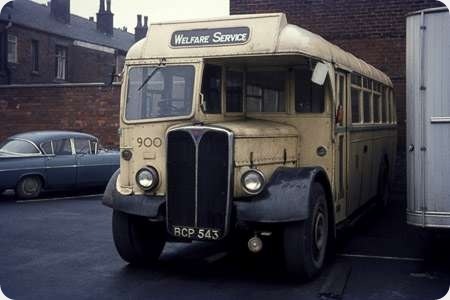 BCP 543 was originally one of twenty-two AEC Regal III 9621E’s with Roe B32R bodies delivered to the Halifax Corporation and JOC fleets in 1949, and was numbered 268. Fourteen of them, including 268, were rebuilt at Skircoat Road workshops during 1953/54 to B33F layout and with modifications made to the front bulkhead to allow for one-man-operation. These were also for a time repainted into a livery of cream with a single orange band to draw attention to the fact that they were OMO and in connection with them being used for the local Countryside Tours during the summertime and bank holidays, though they were returned to standard bus livery later. Withdrawn in 1964, 268 was sold to the Rochdale Corporation Welfare Department who rebuilt it with a rear tail-lift for the transport of disabled people and numbered it 500. They renumbered it 900 in 1970, and it was withdrawn and sold for scrap in 1972. Though Roe’s teak body framing always had an enviable reputation for strength and longevity, when Halifax Corporation had carried out its modifications, the cutting of an aperture in the nearside for the forward entrance directly opposite another on the offside for the emergency exit, along with the bulkhead alterations caused a significant weak spot across the bodywork at that point, and the resultant sag in frame stands out quite clearly – particularly in the offside view above. The nine Regals that retained their rear entrances remained sound until the end – which unfortunately came rather early, some going as early as 1958 and the last one in 1962. Lovely little buses. 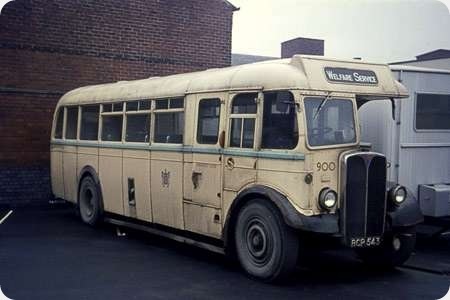 Although allocated to the Rochdale Welfare Department this bus received what was then the current Rochdale Corporation bus fleet livery with the exception that the blue band was a lighter shade. This is interesting as when the new predominantly cream Rochdale bus livery was being introduced in the early 1960’s, two vehicles wore this lighter blue band for a very short period before the darker Oxford Blue trim as pioneered on AEC Regent V no.277 was adopted as the new standard. These were Daimler CVG6 no.238 and AEC Regal IV no.12. I seem to recall the light blue only lasted a matter of weeks on these vehicles before the Oxford Blue replaced it. At the time as a schoolboy spotter I was quite excited about this new livery but once it began to replace the streamlined blue and cream across the whole fleet I came to hate it. It was bland and totally impractical for a northern industrial town where the atmosphere in those days was mucky to say the least. 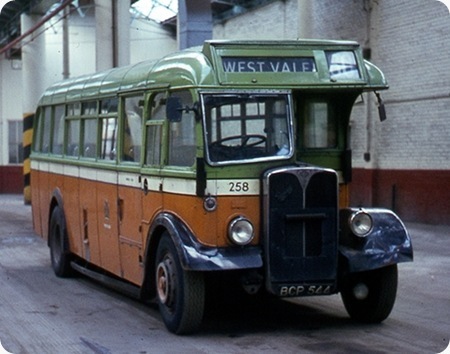 The lighter blue was worn by 12 and 238, and also on delivery by new Weymann bodied Reliances 16 – 20 (3116 – 3120 DK). It didn’t last on these, of course. The blue adopted as standard was the same shade of blue as used on the much lamented "streamlined" livery. Daimler CVG6 number 238 was always easily identifiable because the rubbers holding the destination blind glasses were painted cream whereas it was usual to mask them over during repaint so they remained black. By the way 16-20 were 2116-2120 DK. Halifax buses seemed to undergo a curious renumbering merry go round from time to time, as if fleet numbers were somehow on ration. The number 258 was a case in point. Here is another Regal III of the 1949 batch, BCP 544, which, like its fellow AJX 848 also on this site, was rebuilt from B32R to B33F in 1953/4. It originally joined the ‘B’ Joint Committee fleet as number 269, but in October 1964 it was transferred to the ‘A’ Corporation fleet as number 99. In the following month it was transferred back again to the ‘B’ fleet with the number 268, but it was then renumbered again as 258, which is the number it carries in this picture. 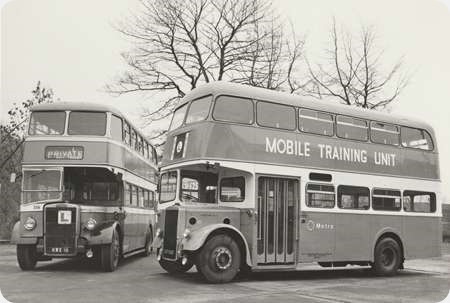 This Regal was the only remaining example of its type when I joined Halifax Passenger Transport as a Traffic Clerk towards the end of 1964, and I drove it from time to time when training for my PSV licence in early 1965. Despite its sixteen years of service, it was a delightful and characterful bus to drive, and carried its age very lightly. One thing that has always intrigued me with exposed radiators is the variety of ways people find for keeping them warm. This one’s ‘appendage’ looks quite professional, certainly far better than a bit of old newspaper! I was going to refer to these over another recent posting. They seem to suggest that AEC and Leyland engines ran "cold" but did Daimlers D’s ever have them? – because they ran hot, it seems, judging by the supplementary air intake, otherwise known as leaving the bonnet side open and resting on the mudguard. Am I anywhere near, Engineers? That’s an interesting observation, Pete. I can’t make out the exact nature of the blind on this vehicle, but, as you say, there were many different approaches. I’ve always been fascinated, for example, with East Yorkshire, which seemed to like placing an aluminium sheet over part of the exposed radiator, although, for reasons I’ve not understood, the actual treatment varied between vehicles, even ones of the same batch. Did the engineers know the fleet so well that they could tailor blinds individually, since although you could raise or lower a flexible blind, an aluminium sheet was a fixed feature? What a marvellous sight to see this morning as I land on the OBP Homepage bleary-eyed ! How lucky you were Roger to have driven this delightful bus. Around this time I was still at school, and this last remaining Regal was sometimes used to transport us the relatively short distance to Woodside Swimming Baths if the more usual Nimbus was unavailable. Our local Bus Club hired it in 1965 for a memorable visit to Bolton, Bury and Rochdale Corporations – on which it performed admirably. It was almost regarded as a mascot by the local enthusiasts. Not long afterwards it was sold to local building contractor Pickles for staff transport. HPT repainted the lower panels cream before sale, and it pottered around the locality in an increasing state of decrepitude until finally scrapped. Unfortunately, the framework modifications involved in moving the entrance to the front – cutting out a large piece when there was already a weakness due to the emergency door being directly opposite, and cutting into the front bulkhead to allow for one-man-operation, severely compromised its structural integrity. The uncanny thing about your photo is that aside from the fact that 258 was scrapped forty-odd years ago, it could have been taken this morning. Parked in what is nowadays referred to as 7-Bay at Skircoat Garage, the building is exactly the same – even to having the same shades of paint on the wall, though today it is maybe peeling a bit more. There was always a timelessness about the old Skircoat Garage, wasn’t there, John. One would have been only mildly surprised to chance across a tram or two, such was the period feel to the place. I wrote to Geoff Hilditch a few years back to send him copies of my small store of Halifax bus pictures, and he very kindly replied in a long letter. One of the things he told me was that the Skircoat depot, along with Elmwood, is facing demolition in the near future. Another piece of treasured transport history seems to be about to vanish. Joe’s comment about hot running engines is interesting. Gardners were always cool runners, which proved to be a bit of a problem when bus heaters became generally adopted. The vast majority of wartime Daimlers had the AEC 7.7 engine, as did the bulk of utility Bristols. Any cooling problems must have been caused by the installation design. Daimler’s own CD6 8.6 litre engine proved to be highly variable in quality between individual examples, the best being satisfactory, but the worst were as bad as the contemporary Crossley HOE7. Installations were probably made to cater for a worst case scenario. 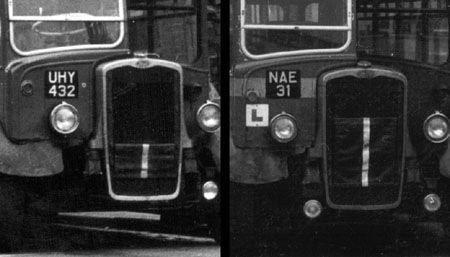 Leeds exposed radiator buses had both an aluminium plate and a roll down blind attached to it. There were two distinct designs the AEC version covered the radiator from the bottom to just over half way The one used on Titans and Crossleys was around 2-3 feet deep and was positioned mid radiator. These were generally fitted around this time of year and were removed in March/April. One of this batch came to Rochdale when I lived there in the early 1960’s to operate for the Social Services Department. If I remember correctly it was fitted with a wheelchair lift. I regret I cannot remember the number of the vehicle but it was painted in Rochdale Corporation’s then new livery of cream with a single blue band. It was a case of what might have been as Rochdale was of course a staunch AEC user but never actually had any post-war single deck half cabs. Isn’t it interesting how some postings generate a lot of comment, sometimes veering off at tangents from tangents from tangents, while other postings generate very little? It’s all part of the fun of taking part in the world of the forum! You’ve noticed that as well, Pete. Of course it’s unrelated to interest or enthusiasm, for there would be plenty of silent admirers, even with quiet posts. What always intrigues me are the posts which run their course, go silent for ages, then spring into life again! And by some queer quirk, I sometimes find the whole thread passed me by the first time round! The Regal that went to Rochdale was BCP 543 and it was given the fleet number 500. It said "Welfare Service" in the destination box. Geoffrey Hilditch is alive and well. I met him the other week on one of his visits to Wigan. He still drives from Torquay and back. He said how much he enjoyed his time at Halifax and wondered if today’s bus managers feel the same, with all the financial pressures. I didn’t know about the garages though – they are still there! Hope ASDA realise that they’re going to have ghosts of AEC Regals amongst their frozen ready-meals! Ian. How sad to think that a useful building providing work, skills, training and local employment has to die to build yet another Temple to the £1 bottle of milk. If I lived there I would never step foot inside the place but, just last weekend I bought a new camera from Curry’s/PC World built on the site of the former Winterstoke Road Garage of Bristol Omnibus Company..but not without thought. The same thing happened to the Newcastle Corporation central works at Byker which employed dozens of people with all manor of skills, as well as being a garage they could virtually build a vehicle from scratch. Now it’s a retail park where you can buy all manor of goods, mostly produced in China. I think it comes under the definition of progress. Reverting to the comments about radiator blinds/mufflers, one company that was very organised in this respect was Bristol. Their blinds had a white stripe down the middle. At various points on the system – the one I happen to recall was at Bath Bus Station – there was a miniature display of a radiator with blind. This would be set to show the desired blind setting for the day, to match temperature. The white stripe on the blind meant that an inspector could spot from a distance that the driver had set his own blind correctly. The attached view shows buses with two of what appear to have been four different settings. You can just make out in the left hand view the clips to which the upper part of the blind would be attached. It would be interesting to know whether the setting was determined by head office or locally. I can imagine there being considerable temperature variation on the same day between the coast at Weston and the high ridge of the southern Cotswolds. I’m a Bristolian and spent several years working for BOC but never knew that! Remember Winterstoke of course and was quite shocked when I saw it had gone. Geoff….I pass the site where Winterstoke Road Bus Garage was located just about every day and the line up of retail warehouses is just a terrible replacement for that superb garage. In my mind I see lines of K, L and KSW parked up with a few of those new fangled Lodekka’s! Once upon a long time ago I spent many an hour with my old friend Clive checking fleet numbers and spotting favourites from the safety of the grassed areas just inside the front walls. I do remember the radiator setting sign also mentioned….it is a good 40 plus years ago but have an idea there was one on the back wall of the old Marlborough Street Bus Station..in the garage/parking area…I remember seeing it/them many times and think one might be preserved at the BVBG garage. I will have a look on the next open day.